Home	/ Story of SVYM / (69) My friend MAB, the eternal optimist! SVYM’s activities that had commenced in Chinnadagudihundi had to be abruptly closed down in January 1985 due to our inability to handle the political tensions in that village. Many of us felt that we needed to focus on building a larger base of membership amongst the students in Mysore Medical College (MMC) where we were all studying. A few of us felt that membership building would be difficult if we did not have any activity to show and wanted to do something to keep the existing members engaged. We were then exploring on how to do both concurrently when Pushpalatha introduced us to her close friend Sumana. I have written about how this led to our work in Thumnerale village earlier in this blog. While we were setting up the dispensary at Thumnerale, I also started talking to other students who could possibly be interested in SVYM and its activities. 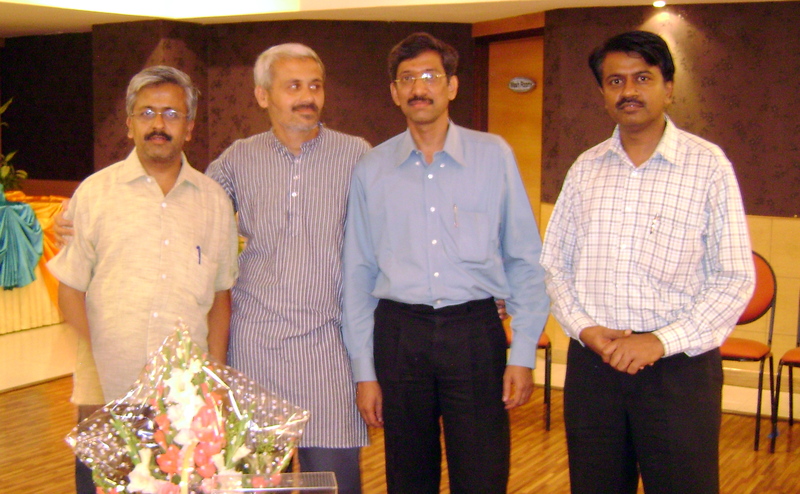 It was during such a process that I first met M.A.Balasubramanya (popularly called MAB). It must have been the month of April or May 1985. Our first meeting is still fresh in my memory. The first thing he told me was “Oh you are the Balasubramaniam who was spoken about in my class”. Seeing my perplexed look, he went on to explain that on the first day of class when he introduced himself, one of the senior professors had mentioned that there was one more Balasubramaniam in the college, two years senior to him. We struck a unique friendship from that day on and I can say that my admiration and respect for all that MAB stands for has only increased. From that day onwards, MAB and his classmates – Seetharam, Vivek and others made sure that SVYM got firmly established not only in their class but also in MMC. In fact, the largest number of students from a single class in MMC has been from their batch and this record is yet to be broken. We still have many of their classmates continuing to engage with SVYM in different capacities and that shows the enormous ground work that was done by all of them. During the entire period that MAB was in Mysore as a student, he was constantly engaged in the rural dispensary at Thumnerale. Family circumstances necessitated that he had to take up a full-time job that paid a regular salary, and he chose to join the Indian Air Force as a medical officer in 1990. For the next 3-4 years, he served in different parts of India and finally got an option to spend the last year or so at Mysore. Apart from giving him the much needed time with his family, this also enabled his continued involvement with SVYM. Even when he was posted to different locations, he ensured that he stayed informed and engaged in as many SVYM activities as possible. Once back in Mysore, he took on the responsibility of furthering the membership and launched many innovative programs. His constant interaction with the medical students kept the organization filled with the energy and dynamism that only the youth can bring. We now need those kind of energies to reinvigorate the membership which went beyond mere numbers and included a very intense and deep level of participation. After completing his tenure at IAF, MAB went on to do his post graduation and specialized as an Anesthetist. He came back to full-time involvement with the organization in the year 2000. Apart from having held different key responsibilities in the Governing Body of SVYM, MAB has also brought his energy and experience into streamlining the management within SVYM. Currently he holds the post of CEO and is tirelessly striving to raise the bar in everything he does. MAB is one of the very few people that I know who is so self-driven and passionate about everything he does. I have never seen him tired or complain that he is stretched for time. His lexicon does not include the words ‘cannot be done’. Everything for him is possible and can and should be done. He can drive not only himself but also those around him to constantly challenge themselves and strive to achieve more than what they think they are capable of. His perseverance in following through is legendary and he can remember the minutest detail in every conversation that he has had. What I have found surprising is that he can remember what we spoke decades ago, but would easily forget the name of the person that he met a few weeks back! On a personal level, I hold him very high amongst the few people that I can rely on. I know that in a crisis, he would be the man to turn to. I still remember how he was instrumental in making sure that my wife Bindu not only survived but also recovered well after a medical emergency that she faced 10 years ago. As the CEO, he has to bring in not only inspirational leadership but also needs to take SVYM through extremely challenging times. Not only is the context for NGOs rapidly changing, but also the need to continually evolve and re-discover our collective strengths. We now need to keep redefining management paradigms to keep ourselves relevant and appropriate, and there is no one better suited for the job than MAB. His sometimes strong views on certain subjects and forceful arguments may be seen as his weakness; but they pale in significance compared to the integrity, professionalism and managerial energy he brings into his job every day. MAB, I am both privileged and honored to have worked with you for so long and look forward to our continued association for many more years to come.